View of “Naama Tsabar: Transboundary,” 2017. For all the comparisons between musical instruments and human bodies—especially the guitar as a stand-in for a wasp-waisted woman—relatively few sound artists confront the gendered history of musical performance. Naama Tsabar is an exception. In “Transboundary,” her first solo exhibition here, she shows four monochrome sculptures in felt, strung with piano wire and attached to amps. Like Robert Morris’s felt sculptures from the late 1960s, their scale evokes the body. 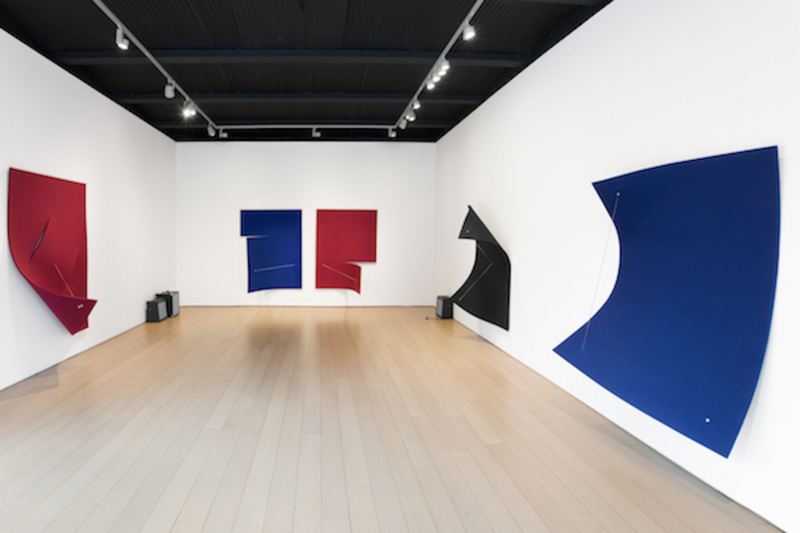 But unlike Morris’s felts, which were arrayed in folds that often resembled the female form, Tsabar’s sculptures are pinned to the wall and stretched taut. At first glance, they appear more related to hard-edge painting than to sound sculptures, such as Rebecca Horn’s Concert for Anarchy, 1990, a piano whose keys “explode” outward every few minutes, with a loud bang. Tsabar’s details slyly nod to formalism. Work on Felt (Variation 18) Burgundy (all works 2017) features diagonal slashes, à la Lucio Fontana. Work on Felt (Variation 16 and 17) Dark Blue and Burgundy, a diptych, feels like an Ellsworth Kelly, but groovier. When activated, Tsabar’s sculptures have a unifying, transfixing effect. During the opening, several female musicians (including Tsabar, who used to be in a punk band) played a set composed especially for the sculptures, accompanied by Lindsay Powell (aka Fielded) on vocals. The felts stood up to Powell’s full-throated voice, with a surprising range of dynamics and emotions. The pieces were stroked, struck, or played with a bow, and had the capacity to respond and resonate with movement—as vivid and alive as the people playing them.